The Right Hon. Thomas. 2nd Earl of Zetland, K.G., M.W. Grand Master of England, 1844-1870. The Right Hon. Thomas, 2nd Earl of Zetland, K.G., was a prominent officer of the United Grand Lodge of England, after consummation of the union of the two Grand Lodges in 1813. He held, in turn, the offices of: - Deputy Grand master, 1813-1820 and 1839-1840, Prov. Grand Master, 1841-1843, Grand Master, 1844-1870. This picture was authenticated and certified by V.W. Bro. Stevenson Cochran, PG Secretary of Glasgow. The picture was in possession of “Lodge of Truth”, No. 22, at the same time as that of the Duke of Leinster – and was removed with it to Arthur Square in 1870. Subsequently the lodge relinquished all claim to ownership and handed over both pictures absolutely to the House Committee. 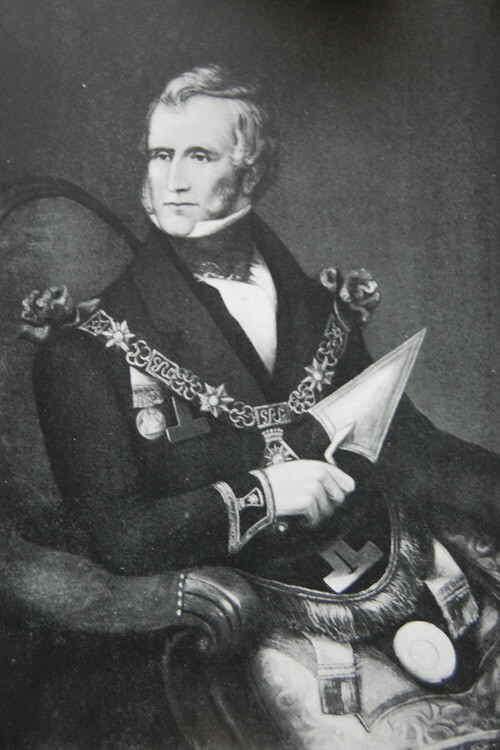 The nameplate was also missing from this picture, and it was only after prolonged research that a cutting was found from the “Illustrated London News” on the laying of the foundation stone of Caledonian Benevolent Institution in Copenhagen Street, London, on May 10th, 1844, featuring a woodcut of the Grand master in full Masonic costume, with a presentation trowel in his hand – all exact reproduction of our picture and captioned “Earl of Zetland”. This was probably the first function of the kind he presided a – the trowel, was a presentation for use on the occasion, and the picture painted as a memento of an important event.